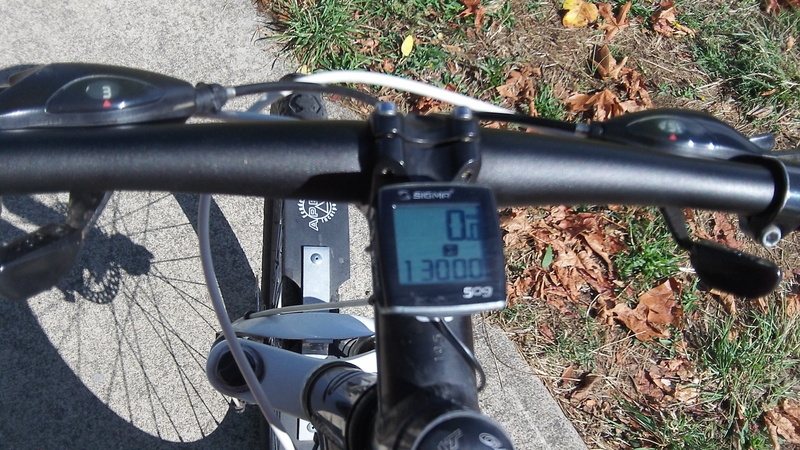 I stopped to get this shot of the bike computer’s odometer reading. As far as milestones go, this isn’t all that big. Still, allow me to pause and depart from the regular fare on this site to report that the computer on my town bike hit 13,000 miles this week. As we’ve all learned by now, most of the stuff the Chinese make for export to the world is pretty good in terms of quality, and this bike is no exception. I bought it at Bike ‘n’ Hike in the fall of 2011 and put a basic computer on it the following spring. So the mileage total represents about three and a half years of year-round riding. I’ve gone through maybe two or three sets of tires, if memory serves, plus a new chain and rear cassette. But the frame itself and the components on it have held up well, even though I ride it three or four days most weeks when I’m in town. 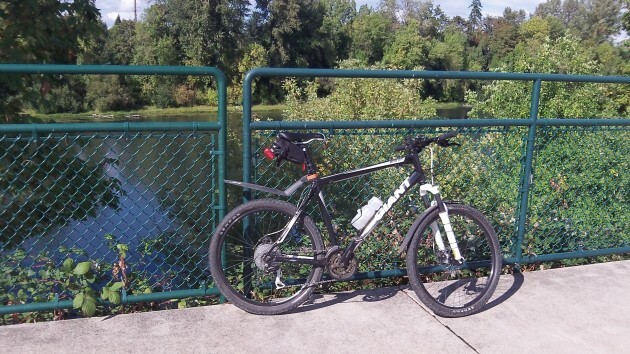 For more or less casual bike riding around the mid-valley, I think a good mountain bike with smooth tires — not knobby ones — is just about ideal. It works great on smooth roads, and it’s just as good on bikeways and on the dirt trails of riverside parks such as Takena Landing and Simpson. And the fat tires can handle the potholes and broken pavement on the city’s older streets. ∗ Upon further checking, Taiwan-based Giant makes bikes at factories in China and Taiwan. I can find no information on exactly where my Rincon’s frame was made. Parked by the river on the Dave Clark bikeway and walking path. This is a new record. Ray and I agree once again. Hasso fills a huge void in local news reporting and editorializing. Hopefully everyone who loves Albany is paying attention to what is written here. Congrats, Hasso. I’ve long said you cover more news on a bicycle with an I-phone than the entire staff at the ADH, post HH. I guess there are now two issues Ray and I can agree on. Put on a couple extra magnets! Great job! I also very much enjoy your information and postings here. You have a great style and write about many things that interest me. I join the others in simply saying that I appreciate the legwork and writing you do for our community Hasso. Good Job!